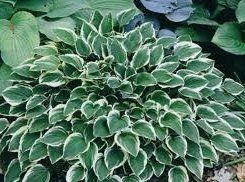 Hosta Diamond Tiara is a darling compact hosta with striking glossy green leaves that are edged in pure white. Lightly fragrant purple flowers bloom in mid to late summer. Plant in well drained soil. Keep moist until well established then water regularly as needed.